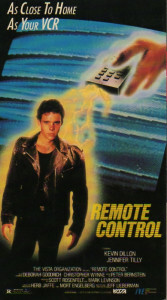 A recent viewing of Jeff Lieberman’s Remote Control (1988) raised some questions regarding the subject matter of the film. 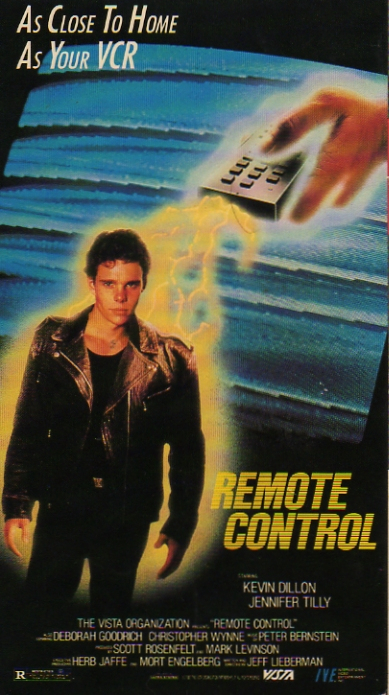 Remote Control details the exploits of a video store clerk to save the world from a VHS tape that causes its viewers to kill. While the subject matter is obviously camp it is notable for the fact that it was part of a larger and mostly unintentional movement of exploitation, horror and science fiction films in the 1980s that explored such fears: physical media corrupting and transforming through subliminal messages, or outright killing them itself. To be clear, this trend was separate from other exploitation fare like Video Violence…When Renting Is Not Enough (1987) and the Guinea Pig series, films which either sought to make movies about people making snuff films or trick viewers into believing the films themselves were legitimate snuff films. The films to be examined were about media that corrupted or killed directly, not the people committing violence on video themselves. 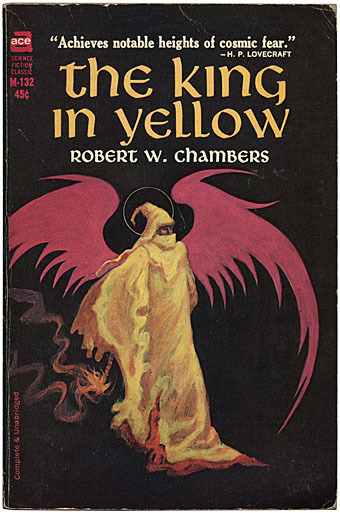 While there doesn’t seem to be a specific film that set off this minor wave, and the notion is as old as the written word thanks to works such as Robert Chambers’ The King in Yellow and H.P. Lovecraft’s creation of the Necronomicon (both of which are enjoying a resurgence in popularity thanks to HBO’s True Detective), something about the 1980s made hostile media films especially prevalent. On the surface, there was a superficiality to the era that made the satirical elements easy. Remote Control references it immediately in its opening sequence with its notion of a bored, thrill-less couple turning to an electronic medium to escape the tedium of their relationship only for that medium to cause them to turn on each other. “The Idiot Box” was a common pejorative used for television during the era, and it was quickly latched onto by culture warriors as a scapegoat for the rapid decline of the nuclear family; so, Remote Control’s very conceit of video as violence was an interesting play on the concept. Slight variations on the idea would be met to have murder as the medium itself, as exploitation directors pushed further towards a parody of Marshall McLuhan’s “medium is the message” argument. As expected, these films were of varying degrees in quality, from the sublimely silly aliens-in-our-TV of TerrorVision (1986) (whose plot would be altered slightly in 1992 as Stay Tuned) to the just plain bizarre zombie television nightmare of The Video Dead (1986) (whose plot would oddly be borrowed wholesale for Ringu (1998) / The Ring (2002)). These films explicitly referenced the satirical notion of television as a violent form of entertainment that could beget only more violence, but both were limited in the intellectual scope of what they were attempting to accomplish. 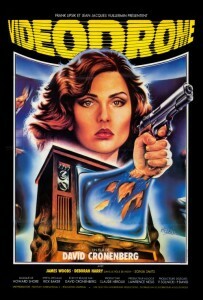 They simply stopped at the conceit of their pitch: “What if TV killed people?” David Cronenberg’s Videodrome (1982), on the other hand, pushed further than either film (and Remote Control, for that matter) to envision that not only was the medium murder but that by that very nature it also had a transcendental quality. At first glance Videodrome is a product of the early cable era, with its gaze directed squarely at pirate signals and low-rent sleaze placating a jaded, cynical population hungry for stimulation. But as the movie develops it takes an aggressive stance on the transformative properties of media. In the story proper Videodrome is a signal created by the government to rid itself of moral degenerates, but when looking at that signal beyond just the context of the film’s plot, it speaks to the intellectual control we’ve been ceding to various forms of media as time progresses. Much like Paddy Chayefsky and Sidney Lumet’s Network (1976), Videodrome was prescient in detailing the ways in which we would allow television (or social media) to alter our reality. But unlike Network, Videodrome posited a physical and spiritual transformation instead of simply an intellectual one. By the end of the film, Max Renn has gone through a blossoming of sorts, changing from an immoral flesh peddler to a living weapon fighting against the very technology that created him; and at film’s end, he’s guided by that same technology to ascend to a higher plane of consciousness by “leaving the old flesh” and committing suicide. The interesting thing here is, Renn after being duped by an evil government using television signals to turn him into a living weapon trusts another group using the same technology. Cronenberg appears to be taking the cynical stance of arguing that all forms of media are dangerous regardless of their intent, for the simple fact that our minds are too pliable and easily guided to resist. Following this line of thinking, one film stands above all others when arguing that emerging technology and the media resulting from it are a veritable Pandora’s Box: They Live (1988). 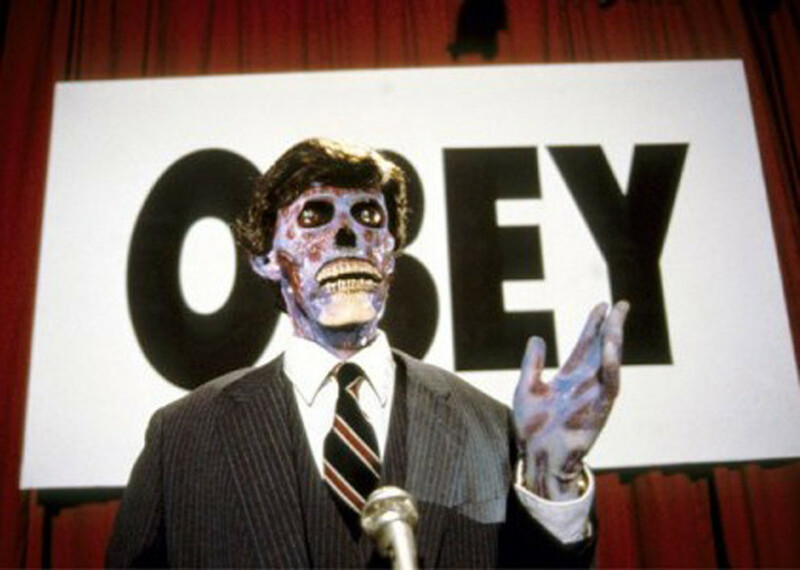 They Live takes a militantly cynical view on the nature of communication and how it can be perverted to keep a population apathetic. Early in the film Carpenter uses television as a vehicle to draw a parallel between the fictional characters in the film and the actual audience viewing the film. Everything the characters in the film watch on television is an elaborate sales pitch designed to sell something, with all of those messages containing a dangerous subtext, just as it is for viewers of the film when they watch They Live, which itself is pitching politics underneath its sci-fi conceit. But while the audience viewing the film is being pitched a slight political allegory, the characters in the film are being conditioned to buy into their own slavery. Carpenter’s argument is that there actually isn’t much of a difference between the two, because all forms of media have an agenda that they’re selling. Everything we view is conditioning us to think in very specific ways even if we aren’t cognizant to where those ideas are taking us or what triggers they’re prepping us to respond to. We may not have billboards that covertly hide commands to CONSUME, REPRODUCE, and OBEY, but we do have 24-hour news networks designed to reinforce ideas that are shaped in our minds from a young age; and oddly enough, it indirectly predicted the Internet and its recent embrace of infotainment, now called “native advertising,” for the generation growing up with its television transforming into infomercials and magazines filled with no actual content save for advertising copy. What’s interesting about many of these films, especially Remote Control and They Live, is that our media was being hijacked by alien forces to sublimate our desires and capacity for free will. The directors seemed acute to the idea that in some way these rapid advancements in technology could not be entirely human, that something else had to be responsible. Remote Control specifically points back to a vintage 1950s science fiction film in which home video seemed like a novel concept, only for the audience to find that aliens were responsible in this instance. 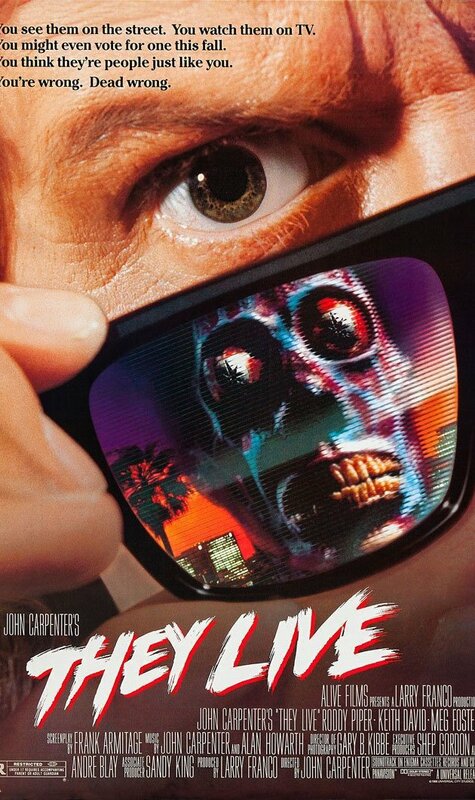 They Live seems to follow suit, offering that aliens have been here for years manipulating and using technology to enhance their control over the humans. Together, along with the other films, the directors seemed to argue that while emerging media has the capacity to transform us (as in Videodrome), it may come at the cost of being human. Either we become cattle (as in They Live), or we become vessels regurgitating the mindless violence spit out at us (as in Remote Control); regardless, our free will has ceased.